Previously on my last article ‘ how to install SMTP on windows 7’ was highly traffic, and considering the same problem on newly launched OS of Microsoft, Windows 8 I have thought to write same blog for it. As windows 8 developer preview has just been released few months ago, it consists of IIS 8. This is entirely new platform. Let me go with how to install or work with SMTP on windows 8. In windows 8 it is quite simple to get start with your SMTP Server. First of all you need to do some work with your ‘Program and Features’ on Control Panel. Click on Program and Features on Control Panel. Go to click on ‘Turn on windows Features on or off’, which is on the left side of the panel. Once this is open make sure that you have enabled the IIS and Microsoft .net Platform too on your machine just making check mark as shown in given snap. 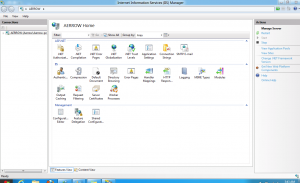 Once the procedure of enabling IIS and Microsoft .net Platform now you need to go on IIS manager. It is quite easy to get reach there. Here are the steps. If you are using Windows Vista® or Windows Server® 2008, click System and Maintenance, and then click Administrative Tools. If you are using Windows® 7 or Windows Server® 2008 R2, click System and Security, and then click Administrative Tools. In the Start Search box, type inetmgr and press ENTER. 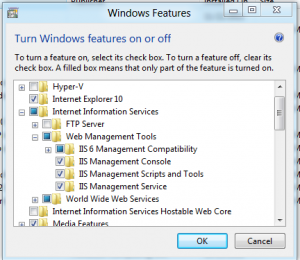 Here the above steps lead you up to the IIS manager now it requires you to configure the IIS Manager. The further process to configure your SMTP is as follows. In Features View, double-click SMTP E-mail. On the SMTP E-mail page, type the e-mail address of the sender in the E-mail address text box. 1. Deliver e-mail to SMTP server: to deliver e-mail messages immediately. This requires an operational SMTP server for which the user has credentials. 2. Store e-mail in pickup directory: to store e-mails in a file location on disk for later delivery by an application such as an ASP.NET application, or by a user, such as an administrator. Type the unique name of your SMTP server in the SMTP Server text box or select the Use localhost box to set the name to LocalHost. Setting the name to LocalHost means that ASP.NET will use an SMTP server on the local computer. Typically, this is the default SMTP virtual server. Enter a TCP port in the Port text box. Port 25 is the SMTP standard TCP port and is the default setting. More than one virtual server can use the same TCP port if all servers are configured by using different IP addresses. Under Authentication Settings, specify the authentication mode and credentials if your SMTP server requires these. If Store e-mail in pickup directory is selected, type the batch e-mail location in the Store e-mail in pickup directory text box.